Eurozone insolvencies remain 70% higher than in 2007. 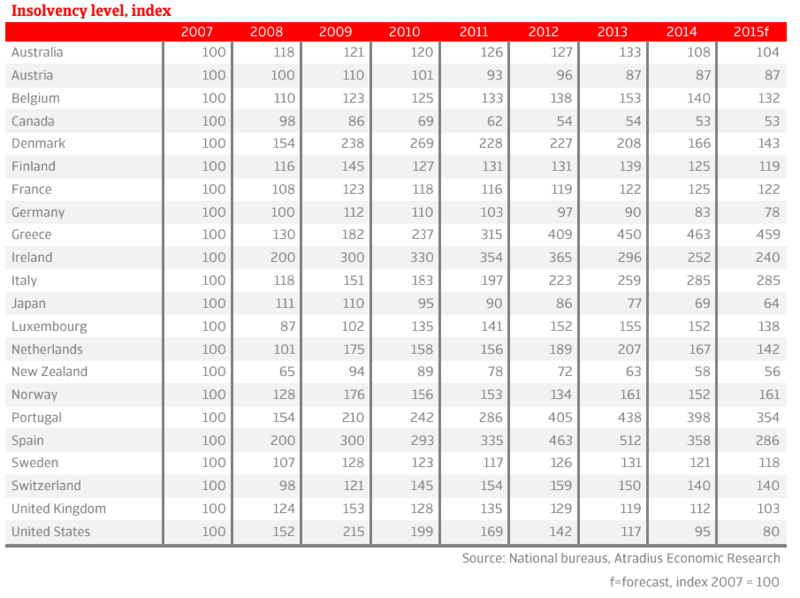 The business climate remains difficult especially in Spain, Italy, Portugal and Greece. Economic conditions in the Eurozone remain challenging and insolvencies, in many countries, high. Consumers are cautious with spending and investment is generally low. And while financing conditions have started to ease recently, banks maintain very strict lending standards making it difficult for companies to roll-over loans or expand business. The modest economic recovery in 2014 and 2015 has only limited impact on the historically high level of insolvencies in the Eurozone. The number of business failures in 2015 is forecast to remain 70% higher than in 2007. 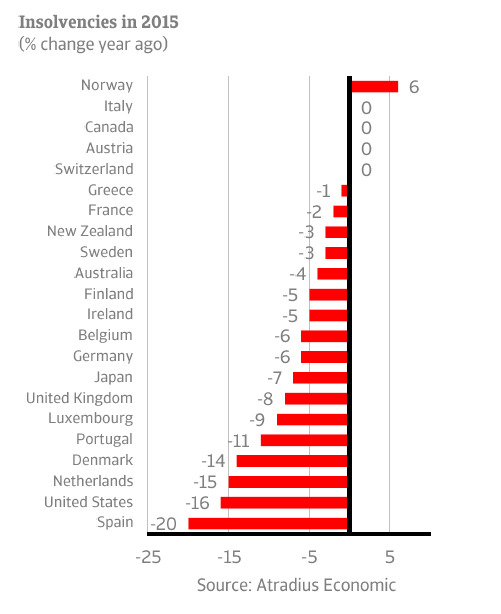 The 7% fall in insolvencies forecast for this year highlights the expectations of little to no improvement (5% or less) for more than half of the countries reviewed. Eurozone periphery countries such as Portugal, Spain and Italy in particular face a difficult insolvency environment in 2015, with business failures anticipated to be almost three times higher than in 2007. With its economy struggling to climb out of recession, last year Italy saw a further 10% increase in insolvencies. Insolvencies in Spain and Portugal are forecast to fall by 20% and 11% in 2015 respectively, but it will be a long way back to normal pre-crisis levels. Excess capacity, or slack in the economy, continues to pose a challenge to companies. The business climate will therefore remain difficult. The uncertainty surrounding the Eurozone outlook is also significant as deflation may get more entrenched undermining the weak economic recovery. Expansionary monetary policy by the European central bank may also prove ineffective in stimulating the real economy. At the same time economic growth is held back by high household and corporate indebtedness. The solid economic recovery in the United States is forecast to result in a further 16% drop in the number of insolvencies in 2015. This would be the sixth consecutive year of lower bankruptcies. As a result the number of insolvencies is forecast to be 20% lower this year than in 2007. US companies are expected to continue to benefit from low financing costs as the Federal Reserve will be cautious in raising interest rates later this year with inflation being low and the value of the dollar rising. But exporting companies may be impacted by the more expensive dollar and see their profit levels fall. Other advanced markets Japan, New Zealand and Australia are expected to see falling insolvencies this year as well. In Western Europe, most non-Eurozone countries can expect falling insolvencies, most notably Denmark (-14%) and the United Kingdom (-8%). Only Norway is forecast to see business failures rise, by 6%, in 2015 as the economy, and many of its core companies, suffer from the lower global oil price. Even if oil prices recover this year, many companies in the industry have already cut back investment plans and put existing developments on hold. 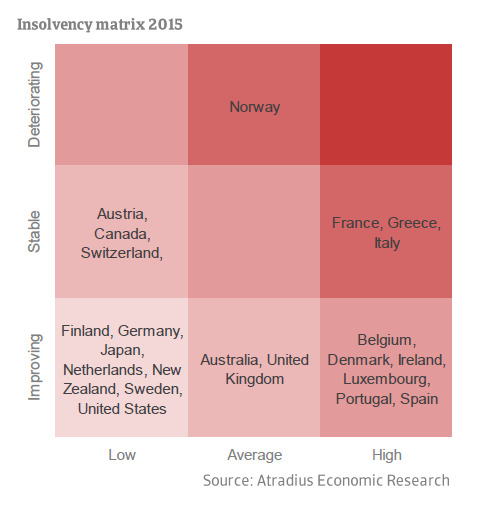 The total number of insolvencies in Norway is forecast to be 61% higher in 2015 than in 2007.